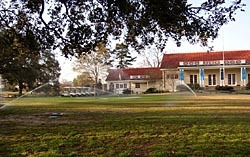 City Park Golf Course was Baton Rouge's first public golf course, and the city's only public course until the mid-1950s. The short, 34-par, nine-hole course was completed in 1926 and officially opened in 1928. City Park Golf Course was built during the "The Golden Age of Golf"--when golf's popularity spread from the upper to middle classes as public courses were built at a rapid pace. Public golf courses increased the popularity of the sport because, unlike private courses, they only charged a nominal fee and did not require membership or annual dues. By 1930, 2.25 million Americans were playing golf on 5,648 courses, an 800 percent increase in the number of courses in 1916. 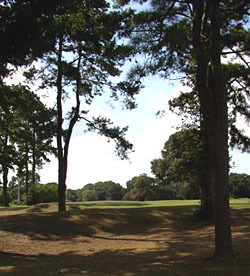 Prior to the opening of City Park, there were two private course in Baton Rouge. In 1923 taxpayers voted for a bond issue to finance the acquisition of park land. The following year, the city signed an agreement to develop a golf course with American Park Builders of Chicago. Scotsman Tom Bendelow was the company's designer and designed hundreds of courses during his career. Bendelow's design for City Park was derived from naturalistic Scottish designs, as was typical for this period of golf course design, and he took advantage of the natural conditions of the land, altering them as little as possible. The course straddles the meandering Baton Rouge Fault, which provides a notably hilly course in a part of Louisiana know for its flatness. Fairways are placed closely together, with no visual delineation. Half of the sand traps of the current course are original, and water hazards on some of the holes are remnants of a bayou in the southwest corner of the course. Local, self-taught horticulturist Steele Burden was responsible for the tree planting, and today numerous mature trees (mostly live oak) define many of the fairways and provide great challenges for golfers. The course also includes the original clubhouse, that combines Colonial and Spanish Revival elements. No longer remaining are other elements of the entire 1920s recreational complex developed by American Park Builders, which included a swimming pool, zoo and amusement pavilion. City Park Golf Course is located at 1422 City Park Ave. in Baton Rouge. The course is open daily 7:00am until dark. There is a minimal daily fee, cart rental is extra. Call 225-387-9523 for further information, or visit the city's golf course website.